Summer is here and with it comes an increased need for your air conditioning system. You will likely find yourself running the air conditioner every day, which means you need it to function as expected whenever you turn it on. When it starts acting oddly, you should shut it down and call in a repair service immediately. Otherwise, you may be looking at a breakdown and a serious repair bill. The good news is that when it comes to air conditioning repair, Worthington, OH residents have options they can turn to. The bad news is that abnormal behavior in your air conditioner still needs to be treated. The sooner you can spot it the better. Abnormal behavior translates into anything that you don’t recognize as part of the air conditioner’s standard operation. Specifics can vary widely, but breaks down into one of the following basic categories. Lack of cooling power. The cooling power may drop suddenly, with the unit blowing milder air. In the worst cases, the air may even be lukewarm or hot. Lack of air flow. Problems with the fan or blockages in the ducts can lead to reduced air flow. In the worst cases, the air flow may drop to nothing. This is a problem because it slows the cooling of your home and forces the air conditioner to work harder to do its job. Strange noises. Odd noises can include anything from humming to buzzing to grinding sounds to clicks. Whatever it is, it can be marked by the fact that you don’t hear it when the air conditioner normally runs. Higher bills. Subtle problems don’t always announce themselves directly. Sometimes, they do their damage quietly and you can’t spot them until it’s too late. The best way to notice them is to check your monthly electric bill and look for any unusual spikes or rises in the cost. If you spot abnormal behavior in your air conditioner, turn off the system and contact the experts at Quality Air Heating and Air Conditioning. 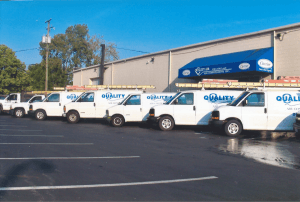 When it comes to professional air conditioning service in Worthington, OH, residents couldn’t ask for a more reliable resource, and we’re absolutely dedicated to your 100% satisfaction. Give us a call today and let us show you what we can do!